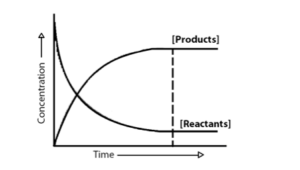 Chemical equilibrium refers to the state wherein both the reactants and the products present in the concentration have no tendency to change with the period of time during a chemical reaction. A chemical reaction achieves chemical equilibrium when the rate of forward reaction and that of the reverse reaction is same. 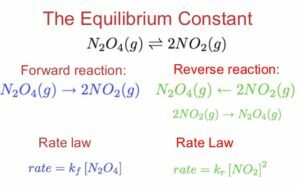 Also, since the rates are equal and there is no net change in the concentrations of the reactants and the products – the state is referred to as a dynamic equilibrium and the rate constant is known as equilibrium constant. Let’s find out more. his equilibrium constant can be simply expressed in terms of the partial pressures of the reactants and the products. However, if it is expressed in terms of the partial pressure, it is denoted by Kp. where T states the temperature, R is the universal gas constant and Keq is the equilibrium constant. Question: A closed container has N2O4 and NO2 gases in it. It has been placed in the lab for many days. What would you consider the container and the gases to be? Solution: A closed system since it has been in the lab, the temperature of the system is the same as its environment.